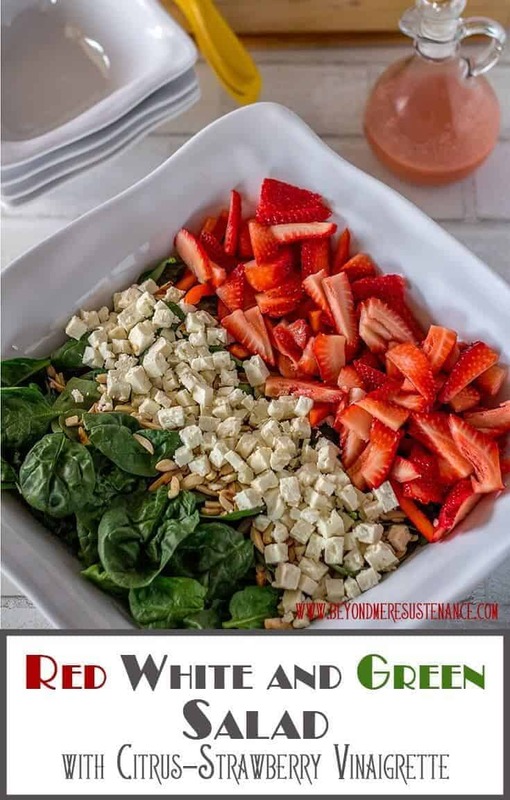 This colorful Red White and Green Salad features strawberries and sweet red pepper (red), feta cheese and slivered almonds (white), and nutrient-rich baby spinach tossed with a citrus-strawberry vinaigrette… A perfect salad for your Cinco de Mayo table, and simple enough for any day of the week! ~~ Joe Baca, American politician. I find it amusing that so many people think Cinco de Mayo is actually a Mexican holiday/celebration. It is not Mexico’s Independence Day (like our July 4th), nor is it really celebrated in Mexico. Cinco de Mayo commemorates the victory of the Mexican army over the French army May 5, 1862 in the Battle of Puebla. So, when I contemplated whether or not to do a Cinco de Mayo post, it was with the mindset that this is an American holiday that celebrates Mexico. If you google “red, white, and blue salads,” you will come up with 29,000,000 results. If you google “red, white, and green salads,” you will find only a few (and those are likely to be Christmas salads). 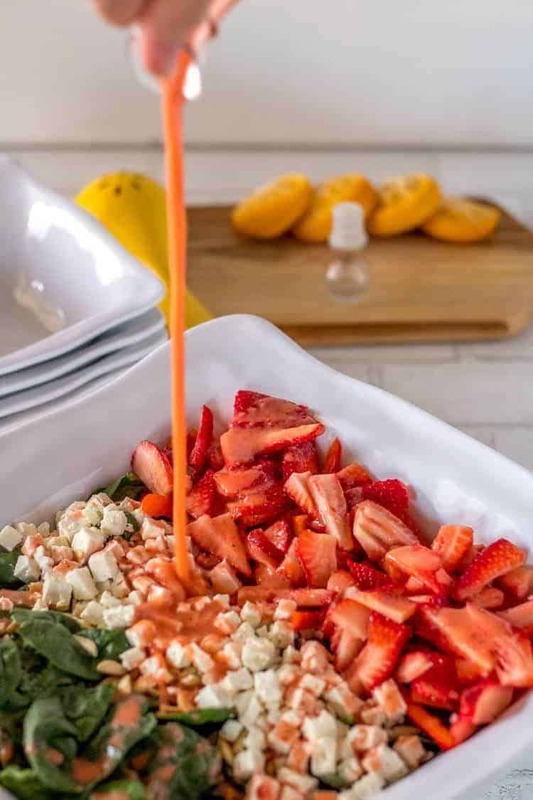 So, in honor of my readers that want to add a healthy salad with colors of the Mexican flag to your Cinco de Mayo table, I’ve created a salad with harmonious flavors that will brighten up that plate of Pressure Cooker Mexican Pulled Pork and Mexican Cilantro Rice. Without further ado, get your personal blender out, a good-sized salad bowl, and a cutting board and knife. You’ll have this made in no time! 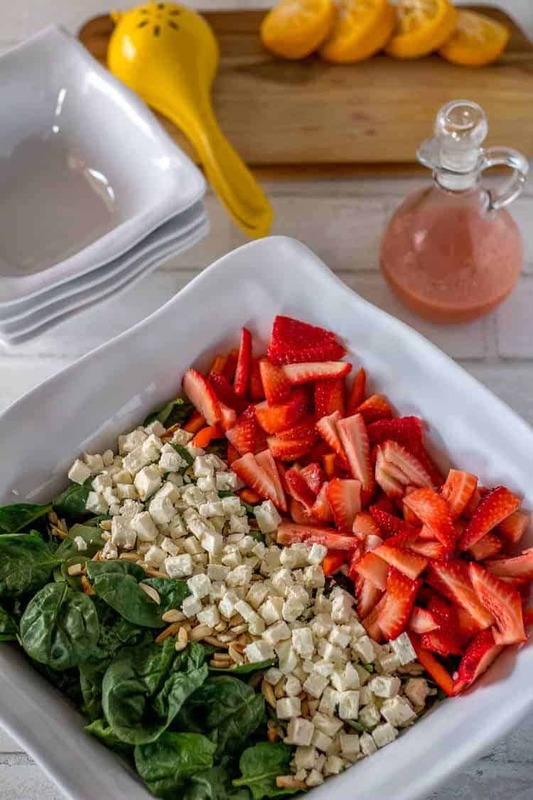 This colorful Red White and Green Salad features strawberries and sweet red pepper (red), feta cheese and slivered almonds (white), and nutrient-rich baby spinach tossed with a citrus-strawberry vinaigrette... A perfect salad for your Cinco de Mayo table, and simple enough for any day of the week! Add all vinaigrette ingredients to a blender. Blend until very smooth. Set aside until ready to toss the salad and serve. (See photos). To arrange salad as shown in top photo: Cover the salad bowl or platter with about 1/2 the spinach. On the right 1/3, arrange the strawberries and red pepper strips. On the middle 1/3, arrange the feta and almonds. On the left 1/3, arrange the remaining spinach. See top photo for reference. 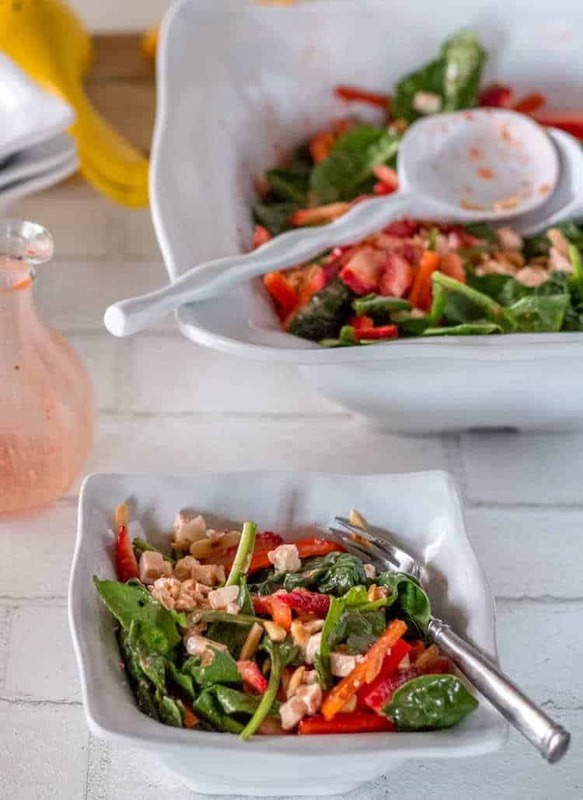 Either pour the vinaigrette into a cruet and serve on the side, or toss with the salad before serving. Enjoy! We still have Meyer lemons and blood oranges, so I used a combination of citrus juice. Keep in mind that a regular lemon will require more sweetening, so be sure to taste the vinaigrette. I used a shallow, square salad bowl, and it worked our really well. A platter with a lip would be fine too. Salad ingredients may need to increase or decrease according to your serving piece. The exact amounts are not really important. Macronutrients (approximation from MyFitnessPal.com): 322 calories; 14 g protein; 24 g carbohydrates; 20 g fat. This is such a fresh and pretty salad perfect for spring and the vinaigrette is to die for! I just adore your recipe! 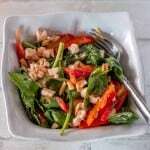 It tastes great, has all the right ingredients to make it a wonderful salad combination. Thanks for sharing. Love this salad and I think I could just drink that vinaigrette. It's starting to get warm here so looking forward to sitting on the back patio enjoying this salad. Thanks! The vinaigrette is pretty drinkable ;-) We're beyond "warm" in south Texas, and I can attest to the fact that it's great on the patio! This is really incredibly good, and not just for Cinco de Mayo!